“If I had a popcorn stand on Courthouse Square, I would have a board,” said Marty Grunder, quoting one of his mentors, Clay Mathile, former CEO and owner of The Iams Co.
His point? You don’t need to be a large company or wait until “you have your act together” before you create a board. 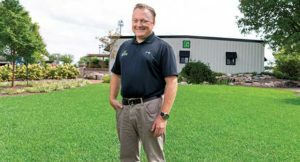 Grunder, president and CEO of Grunder Landscaping Co., established his first board in 1994 and “messed it up something fierce,” he said. After a few years of experimentation and guidance from the nonprofit Aileron, which Mathile founded, Grunder found his way and has seen excellent results from listening to his board members. Grunder and his webinar co-presenter Mark Thompson, former business adviser at Aileron, offered the following tips for landscape businesses looking to create a board. Do not require fiduciary responsibility. In other words, make it clear that your board members have no legal or financial responsibility to your company other than providing ideas, accountability and wisdom on topics such as strategy, sales, finances and personnel. Do pay. Grunder pays his board members $600 per meeting and holds four meetings per year. He notes board members aren’t doing it for the money. “The only reason you pay is to get folks to take it seriously,” Grunder said. Do follow a regular meeting structure. Grunder Landscaping Co. board meetings start at 8 a.m. Some board members arrive at 7 a.m. to see the morning rollout. The meeting usually runs until 11:30 a.m. and is followed by lunch. The agenda typically includes a financial update, a president’s report and a few important issues. Do they make you think differently? Will they push you to get better? Do their values align with yours? Formalize the relationship. Once you’ve decided on someone, formally extend him or her an offer to join the board. This offer may include a letter of indemnification and a nondisclosure. The process can be intimidating, but Grunder encourages landscape business owners to get over that feeling and go for it. Interested in learning more about Aileron? Marty Grunder is teaching the two-day Course for Presidents exclusively for landscape businesses Jan. 8–9. You’ll learn Aileron’s Professional Management System and get six one-on-one sessions with an Aileron business adviser to work on engaging your employees and implementing what you learned. The cost is $1,800. To learn more, contact Grunder at marty@growgroupinc.com.